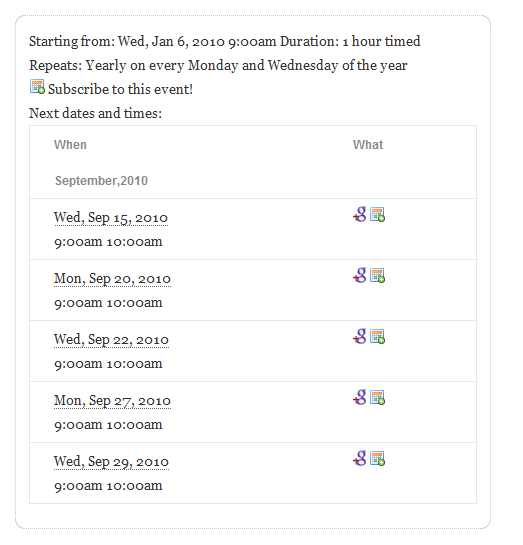 The Event Information Template defines the event detail displayed when viewing a event by itself (or in a blog archive, NOT a calendar page). The default settings are aimed at complex recurring events that may have many recurring dates. 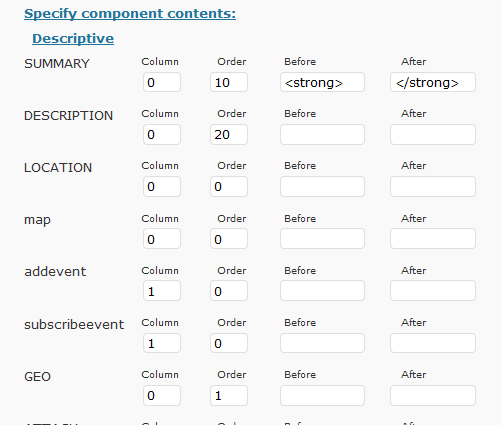 These default settings have lots of extra text for each field, partially to assist you in understanding the field. Note that the event description (aka the post content) will never be shown in the ‘next dates’ of the event info, as this creates an infinite loop of post content inside itself. Decide if you want the event details for each post to display before, after the content or ONLY if you add the eventinfo shortcode to the event content. 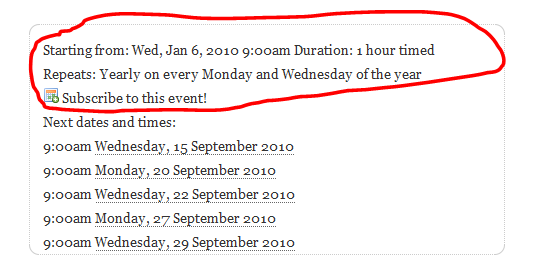 one of the fields is the “next dates” ie: a list of the upcoming dates for that event. 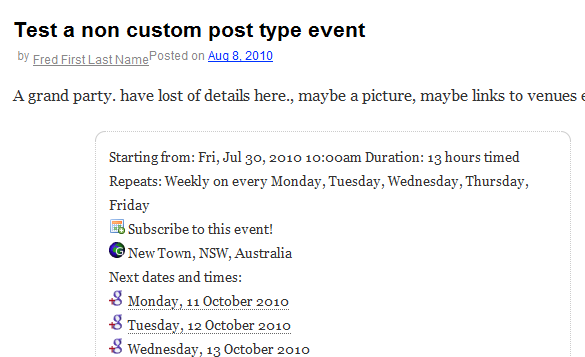 This “next dates” list is configured by the list type for the template. Configured under the ical-events-list section, similar to the calendar lists. 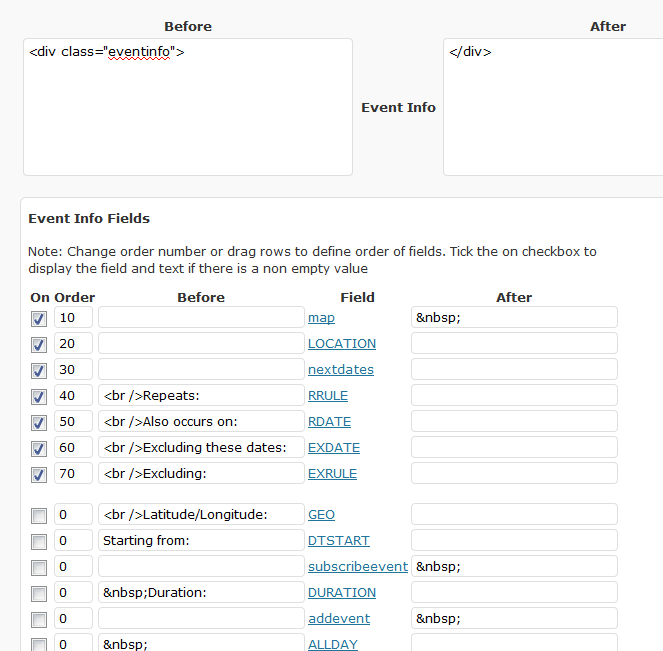 If the bulk of your events are simple, non recurring events, then you may prefer to use the list type alone, and not the event information template fields (except for ‘next dates’ of course) . Any special styling for the whole div can be specified in the ‘big’ before and after box. Note: the preview is previewing with admin css NOT your theme css. You will still need to check whether it all plays nicely together. 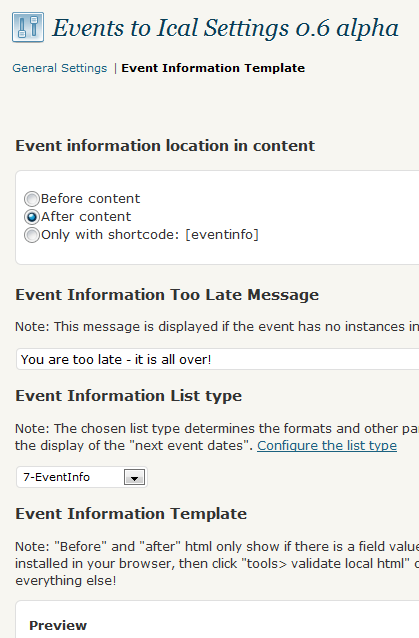 Partial List type Configuration for event information template. Note the summary, description and location are switched off here.